Today we are pleased to present our fifth annual list of US mid-sized information technology companies with momentum. We publish this list because it is our responsibility as a financial advisor to provide the advice that maximizes your net worth. As proud as we are of our investment service, we think we can add even more value by helping you start your career on the right foot. That’s because choosing the right job can add far more to your ultimate net worth than making good planning or investment decisions. We believe the companies we list each year are the ideal places for young people to start their careers because they are all highly likely to turn into large businesses, and nothing early in your career is more important than achieving success — and nothing signals success more than working for a successful company. For a complete explanation of this logic, it’s important that you read the post that accompanied our original list: 48 Hot Tech Companies To Build A Career. To qualify for our list, a company must be privately held, have a current revenue run rate between $20 million and $300 million and be on a trajectory to grow at a rate in excess of 50% over at least the next three or four years. This year we’re adding a further qualification: the companies must have compelling unit economics. Selling a product at very low margins can lead to rapid revenue growth, but it doesn’t necessarily imply a great long-term business. We built our list by surveying the partners of the following 14 venture capital firms: Accel Partners, Andreessen Horowitz, Benchmark, DAG Ventures, Greylock Partners, Index Ventures, Lightspeed, Kleiner Perkins Caufield & Byers, Matrix Partners, Redpoint Ventures, Ribbit Capital, Sequoia Capital, the Social Capital and Spark Capital. I am struck by a few things this year. First only 8 of the 28 new additions were consumer companies. A higher percentage than ever (79%) of the new additions are from the Bay Area. Half of the new Bay Area companies are based south of San Francisco (the traditional Silicon Valley), which is probably a function of the high percentage of enterprise companies. This counters the trend of San Francisco gaining share. Los Angeles had a strong showing with 4 new additions, which is a much higher percentage (14%) than we would traditionally expect. The number of IPOs declined to an all time low of 2 this year although I understand a number of our listed companies are in the process of filing their registration statements with the SEC. There were also very few company sales. We had a very large number of drops due to slowing revenue growth relative to previous years, but the vast majority of the dropped companies are still growing at a rapid rate even though they don’t qualify for the lofty hurdle of 50% expected compounded growth for the next few years. 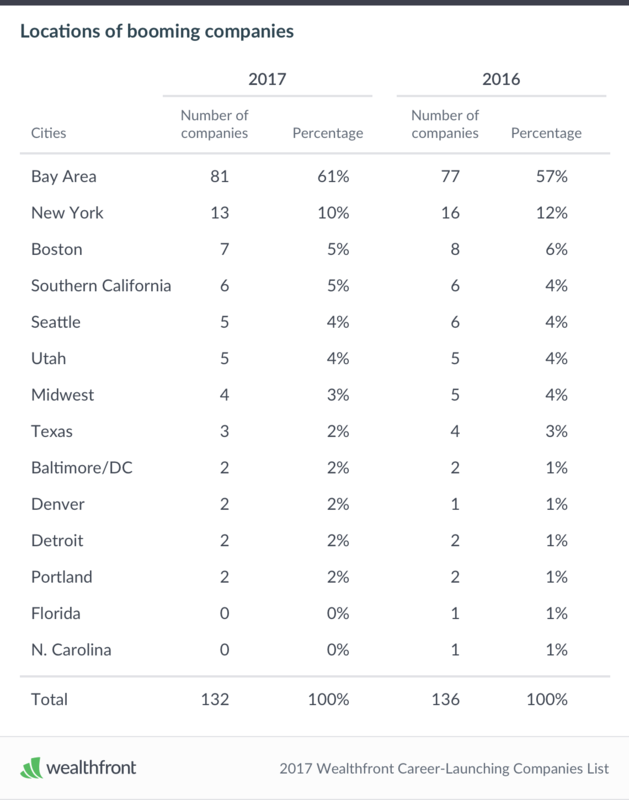 As usual the majority of the companies are based in the San Francisco Bay Area (61%). The majority of the Bay Area companies (58%) are still located in San Francisco rather than Silicon Valley, although this is the second year in a row in which San Francisco has lost share and is down from a peak of 70% in 2015. All geographies other than the Bay Area lost share this past year. While other geographies may be experiencing an increased level of startup activity, it still appears that the more successful companies are likely to be based near Silicon Valley. This means you should seriously consider moving to the Bay Area to launch your career and consider moving home to start your own company once you’ve gained the halo and experience. Enterprise gained share to 64% of the companies, up significantly from 60% in the previous year. This year only 3 of the Bay Area consumer-focused companies are not headquartered in San Francisco and that’s down from only 5 the previous year. People who want to work for a consumer facing company on the Peninsula may need to look for slightly earlier stage companies. There are still only three hardware companies left on the list and 2 are based in the Bay Area (one moved from North Carolina to get access to better talent). This is amazing when you consider that semiconductor and hardware companies created Silicon Valley. We hope you find the 2017 list helpful. Please remember it is very important to evaluate these companies in the context of the advice provided in our Silicon Valley Career Guide. While it is always possible that we may have missed a few companies, we believe this list is an excellent start for professionals looking for differentiated success in their careers. We hope that you will also consider opening a Wealthfront account if you find our advice valuable. Nothing in this article should be construed as tax advice, a solicitation or offer, or recommendation, to buy or sell any security. This article is not intended as investment advice, and Wealthfront does not represent in any manner that the circumstances described herein will result in any particular outcome. Investment advisory services are only provided to investors who become Wealthfront clients. For more information, please visit www.wealthfront.com or see our Full Disclosure. Andy Rachleff is Wealthfront’s co-founder and Chief Executive Officer. He serves as a member of the board of trustees and vice chairman of the endowment investment committee for University of Pennsylvania and as a member of the faculty at Stanford Graduate School of Business, where he teaches courses on technology entrepreneurship. Prior to Wealthfront, Andy co-founded and was general partner of Benchmark Capital, where he was responsible for investing in a number of successful companies including Equinix, Juniper Networks, and Opsware. He also spent ten years as a general partner with Merrill, Pickard, Anderson & Eyre (MPAE). Andy earned his BS from University of Pennsylvania and his MBA from Stanford Graduate School of Business.